2013 is almost over! It was a great year. I started this blog and I'm still overwhelmed with the kind responses and your support! If someone told me that in just 4 months I would reach 4000 followers on Instagram I wouldn't have believed them. But its true! In order to also reach all those inspiring people not on Instagram I decided that in these last couple of days of this year, it was time for a Facebook! Here I will inform you about the latest blog posts! So if you want follow me there just click the link or hit the button in the side bar on the right! Although 2013 was great, I'm also looking forward to 2014. I'm working on a new and exciting project with which I hope to inspire you even more! Hopefully it's done January this year. But 2014 will also be the year that I'm going to visit Brazil and after 4 years of hard work, I will obtain my PhD! But know on to the real content of this post, the recipe for these delicious Oven Baked Eggs with Spinach and Tomato! These are perfect for breakfast or serve with a slice of whole wheat (spelt) bread for lunch! Preheat your oven to 200 degrees of Celsius. Put the spinach in a colander and pour over a kettle of boiling water to wilt the leaves. Squeeze out excess water and divide between two small ramekins. Cut the tomato(es), mix with the sweet paprika powder and add to the ramekins with the spinach. Make a small well in the centre of each and crack an egg. Bake for 20-24 minutues depening on how you like your eggs. I'm always trying out new smoothies by just putting things in a blender that I have in my refrigerator and by accident I made this smoothie and it was absolutely delicious! It really is blueberry heaven in your mouth! Hope you enjoy it as much as I did! You can have this as a post workout snack, as a breakfast or have it complement your lunch! Simply blend all ingredients, except the pecans, in your blender until smooth. If it's a little but to thick just add more almond milk! Poor it into a large glass and top it of with more blueberries, 2 pecans and some more shredded coconut and this heavenly smoothie is ready! Today it's my birthday and I'm already turning 26! Time flies! Of course I'm having friends and family over today and decided to make some clean treats and my mother offered to bake her (not so clean, but delicious!!) apple pie and cake. I made the Pecan Blondies posted yesterday and a new recipe! These delicious blueberry muffins which are gluten and dairy free! It's basically the same recipe as my Lemon Poppy Seed Muffins but since I added some fruit I used less oil! Mix the almond meal and baking powder in a large bowl. Then add the eggs, agave syrup and vanilla extract and mix with an electric hand mixer. Bake them for 25 minutes in your oven until they are golden brown and the centre springs back. Check with a toothpick, if it comes out clean and dry they are done! And it was finally time to make them since it's my birthday tomorrow and I will turn 26! So I'm trying out some healthy baking goodies and these Gluten Free Pecan Blondies are one of them. I made some small changes to the recipe so here it is. And you can also serve these with some whipped cream of ice cream as a delicious dessert for Christmas! Combine all wet ingredients in another bowl and make sure you give it a good whisk so the eggs are beaten. Then mix the dry and wet ingredients and when everything is well mixed add the chopped pecans. Line a 20x20 baking dish with grease proof paper. Put the mixture in it and bake for 35 minutes in the oven until a toothpick comes out clean. Time to present you with the second menu I believe is suitable for Christmas but of course, also any other time of the year when you have guests over and you want to impress them with a delicious, healthy, homemade meal without spending hours in the kitchen! I started with a Vegetarian Menu and a Chicken Menu and now I will give you an amazing Fish Menu! For this menu I choose a somewhat Italian style. These three courses are my favorite vegetarian options and the guests I served these dishes to absolutely loved them! So if you want to impress your family with a healthy bit amazing vegetarian menu you should absolutely give this one a try! Of course you can substitute the quinoa for just regular (brown) risotto rice. How you can make this one is the same as for the quinoa recipe, it only takes a little bit more time and if you want you can add a glass of wine to the risotto when you crumble over the vegetable stock instead of the glass of boiling water. My Pumpkin Soup. You can make this earlier during the day and only heat it up when it's time to start! Surprise your guests with a small appetizer during your starter and your main menu. My family and I always like to make a spoon with smoked salmon, fresh basil and some cottage cheese. And a spoon with 'Dutch shrimps' (the small ones), some cocktail sauce and fresh parsley. Simple, easy to make and perfect! And for our main course you definitely need to make my amazing codfish with a delightful crust served with a nice simple salad and of course the rosemary thyme potatoes. For this dish I would also suggest that you make two simple, yet delicious side dishes. A carrot puree and peas with a twist! For the carrot puree you need 100 gr carrots per person and some fresh thyme leaves. How do you make it? Clean the carrots, cut them into slices (in your food processor). Put them with a little bit of extra virgin olive oil, pinch of sea salt and some fresh thyme leaves in a hot sauce pan. Pour enough boiling water with it so they are just under, put the lit on the pan, turn up the heat and let them cook for about 15 minutes or until tender. When they are cooked, let them drain, put back in the pan and puree them. If necessary season them with salt and pepper. Put a large pan on high heat. Wash the salad leaves and cut them in your food processor. Add the butter and the flower to the pan together with the chicken stock and some freshly torn mint leaves and beat with a whisk until a smooth, simmering sauce. Add the salad and peas with the juice of half a lemon and a splash of boiling water. Give it a good stir and season with salt & pepper. Leave them until everything is heated through. A fruity dessert for this menu! How do you feel about a healthy banana split?! One whole banana might be a bit much after a large meal, so you can share or cut them in half! I started with a Vegetarian Menu and now a Meat Menu! Another simple menu with which you will definitely impress your friends and family! My Fig & Ham Bruschetta's. Easy to make and if someone isn't a huge fan of goat cheese, simply omit it or replace with for example, feta cheese! Surprise your guests with a small appetizer during your starter and your main menu. And since the theme of this menu is meat an amazing spoon with Beef Carpaccio can't be missed! What do you serve for the main course? Well that's a very easy question to answer! Serve the Oven Baked Chicken with Rosemary Thyme Potatoes! You can't go wrong with that and it almost certain that you won't fail! Serve it with my colorful Beetroot Salad and your dinner is complete! Yes, we are going to cheat during dessert!!! And you are going to love it! You will make my Totally Nuts Dessert! The ice cream I use in this dessert is called Totally Nuts (for the Dutchies: it's from the 'Albert Heijn huismerk') and it's one of the best ice cream flavors I ever tasted)! For anyone that lives outside the Netherlands, you need to find ice cream with a caramel flavor and chopped pecans! How do you make this dessert and what do you need? Per person you need 2 cookies which we call "Kletskoppen". These are very crunchy cookies that contain lots of sugar and nuts, usually almonds. And I always like to serve it with red fruits like blueberries, strawberries and raspberries. In my previous post 'How to survive Christmas' I gave some tips to make sure that you don't feel guilty if you indulge in all the delicious Christmas snacks and some tips for healthy activities and foods. Following this post I made a vegetarian, fish and meat menu which you could serve during Christmas dinner which are healthy and easy to make! Starting with the Vegetarian menu and the other two will follow later today! Of course you can also make this menu any other time of the year!!! My Simple Tomato Soup. You can make this earlier during the day and only heat it up when it's time to start! (quinoa) Mushroom Risotto with my delicious Tomato Bruschetta on the side and a simple salad! What kind of salad could you think of? Well this is my favorite salad to serve with quinoa? A delicious corn salad with arugula, sundried tomatoes, cherry tomatoes, cucumber and roasted pine nuts! Black Bean Brownies with a scoop of ice cream of your choice! I made this delicious salad about a month ago, it was a hit and I really liked it so it's finally time to share it with you. And yes you should definitely try it because it was delicious! Don't forget to give some feedback on the recipe and share what you think of it by leaving a comment! Preheat your oven to 180 degrees of Celsius. Slice the goat cheese into thin but not to thin slices and put them on a baking try lined with grease proof paper. Halve the figs and brush the side of the pulp with agave syrup and put them ("pulp side" up) on the baking dish. Bake in the oven for about 15 minutes until the figs are caramelized and the goat cheese is golden brown. Meanwhile put the salad on a plate or in a bowl, roast the walnuts for a couple of minutes and mix the ingredients for the agave-mustard dressing. Thinly slice the cucumber and divide the cherry tomatoes into parts and mix with the salad. When the figs and goat cheese are done put on top, followed by the walnuts. Add dressing to taste and dig in! Yes, it's time for a Christmas Smoothie! So decided to try out some smoothies with Christmas colors red and green! Okay, I know, it has turned out pink, but on top the goji berries are bright red and the coconut grater represents some snow and of course some Christmas balls needed to be represented in the form of blueberries! Rinse the blender and then blend all the ingredients for the green layer until smooth. If the mixture is too thick just add more water. Pour on top of the pink layer. Then finish with a straw and the ingredients for the topping! I love eggs and I eat one every day! But today I wanted something different so I decided to give a poached egg a try! The first one failed miserably but the second one turned out perfect!! I always imagined that making poached eggs was very difficult, well it's not! So if you want to make one yourself make sure you read this post! You can easily have this for breakfast or serve with a salad for lunch! And doesn't this look fancy when you serve it for Christmas breakfast or brunch?! Boil water in your kettle and put the slice of bread in your toaster. When the water is boiled pour it into a pan (I used a saucepan) and make sure that the water is at minimum 5 cm high. Bring back to a boil, add some salt and then slightly lower the heat but make sure it is still boiling! Break the egg in a small glass or bowl, make sure the yolk stays intact, and gently pour it into the boiling water. Use a spoon to make sure that the egg white remains centered and boil for 3 to 4 minutes so the yolk is still nice and soft. Get your slice of bread out of your toaster, cut the avocado and put on top and season with pepper. Cut the cherry tomatoes and spring onion and sprinkle over the bread and your plate. When the egg is done, gently get it out of the pan using a large spoon and put it on top of the sandwich. If you want you can serve it with some fresh basil leaves. Little tip from one of my Instagram followers: Add a little amount of white vinegar to the boiling water! This also prevents the egg white from 'leaking'! It's December, in the Netherlands 'Sinterklaas' is back to Spain.. and in America Thanksgiving has passed. So the Christmas trees are back in our houses, the streets are brightened with Christmas lights and our houses are fully decorated. So Yes, it's finally Christmas time! A time of joy and love. It's actually one of my favorite times in the year! As a bonus, I'm also celebrating my birthday this time a year. Christmas means it's time to connect to all your love ones and do fun things with friends and family, drink wine and eat delicious food! Yes, food and not always the most healthy food.. But it's my opinion that Christmas wouldn't be the same without a little indulgence! There is no harm in cheating these days, but where do you draw the line? How can you enjoy Christmas foods and not go overboard?! Well, I've been giving it much though and I would like to share with you some tips to survive Christmas in the most healthy way there is, whilst you can still enjoy all the good things. We always spend 26th December (Boxing day) at my parents' house so this year I offered to cook dinner. This way I am in charge of what we will eat and I can make sure that there are enough vegetables (my parents don't normally eat lots of veggies, mostly salad). I will also make a grocery shopping list and bring some of my own products to make sure that they are as clean as possible! On the blog you will now also find an overview of all the healthy recipes that I believe suit Christmas! And in my opinion these recipes are even tastier compared to unhealthy cheats! I made a special heading Christmas which lists all sorts of delicious Christmas Meal Ideas!! Here you will find, among other things, a delicious starter: Fig & Ham Bruschetta or a traditional Tomato Bruschetta. But you can also serve a simple Tomato Soup or Pumpkin Soup. And what about a delicious Crusty Codfish served with Oven Roasted Rosemary Thyme Potatoes for main course and my amazing black bean brownies with a scoop of ice cream for dessert?! Some of the lunch sandwich recipes are also perfect to incorporate in your Christmas breakfast or brunch. For example: Avocado Pomegranate Sandwich or the Smoked Salmon Sandwich. If you feel like pancakes why not make healthy ones like my Coconut Meal Pancakes?! And make a healthy but delicious Gingerbread which is perfect with organic butter! Make sure you check it out! And also keep an eye out for one of my next posts in which I will compose some complete Christmas meals. As a already mentioned, indulging is inevitable at Christmas. Okay, if you really really want to it's possible, but it's a time to enjoy and you don't have to be that hard on yourself. But still moderation is key! A great tip I read somewhere whilst preparing this post was to pick your indulgence. If you decide to have ice cream or chocolate cake for dessert, then make sure your day is filled with enough nutrients. Especially your breakfast is very important so you can give your body the best possible start which will help you during the day. And don't forget to enjoy your ice cream or cake! Where is the enjoyment if you feel guilty about it! And remember a cheat once a while actually boosts your metabolism and is very good for your mental health ;). Proportion control, especially for the snacks! The most weight gain during Christmas comes from snacking on all those snacks offered! Of course it's good to have some of them, if they are delicious why not!? But one or two hands sugar coated nuts or 3 small toasts are just as good as the whole bowl! So make sure you control the amount of snack you're having. And if you know that dinner is served in about an hour, why fill your belly with all these snacks. First of all you don't have room for the whole dinner, but you will eat it all anyway and as a result you will almost certainly be guaranteed that you feel like you can roll back home. And a little tip: make sure you have sugar free mints or chewing gum with you. Pop a mint just before you go to your family and this will help with the urge to devour all the snacks that are going round. Even when you've finished the mint you will still have the lingering mint tasts inyour mouth like after brushing your teeth. And nobody feels like eating anything after you have brushed your teeth! Whatever you do, make sure you keep moving! Of course I don't mean that you should do some hard-core weight lifting schedule or run 20 km if you don't want or don't have the time, but you need to do some moving of light to moderate intensity. Take your family for a walk and get some fresh air. Or if you don't feel like going out or the whether isn't cooperating, incorporate some small exercised during your day. While you brush your teeth do some squats and lunches. Or when you are waiting for those delicious brownies to be baked in the oven grab a chair and so some triceps dips, planking on a cushion from the sofa or some pushups. But another and way more fun way: turn up the Christmas music and start dancing! You actually burn a lot of calories by dancing and it's fun! So why not?! It's Christmas after all! The point I want to make is that, no you are not going to lose weight during these days but keep your muscles activated to minimize damage! Or just a simple soup or any other combination of just fish/chicken with vegetables! But most of all I wish you a Merry Christmas and Happy Holidays! Who doesn't love carpaccio? Well I do! If I lunch in a restaurants I almost always order a carpaccio salad or a sandwich! I'm currently preparing Christmas dinner for my parents, brother and his girlfriend and this is probably going to be our starter or as a small course during our starter and main dish. I will give you the recipe for a starter for 1 person and if you want to serve it as, for example, a spoon between courses just divide the ingredients by four! And if you want this for lunch just serve it with two slice of whole wheat organic (spelt) bread! Place the thinly sliced carpaccio on a plate. Top with the arugula, grated parmesan cheese, roasted pine nuts and sundried or cherry tomatoes and finish with the dressing of your choice! Bruschetta is very easy and simple to make and if I have friends over and my meals are kind of Italian I always like to serve these because it's not expensive to make and just delicious. You can have it as a simple starter or as a side dish. Either way, your guest will love them! The tomato mixture can easily be made earlier that day so you won't have to spend a lot of time in the kitchen when your guests arrive. In a small bowl mix the regular olive oil with one crushed garlic and some salt and pepper and set aside. Remove the seeds/pulp from the tomatoes and peel the red onion. Finely chop the tomatoes and red onion and put in a bowl with 2 garlic cloves, the extra virgin olive oil and balsamic vinegar. Slice the ciabatta bread and brush lightly with the olive oil - garlic mixture. Put the on your griddle (covered with grease proof paper) and bake for 10 to 15 minutes in the oven until their golden brown and crunchy. Put them on a large, beautiful plate and put the tomato mixture on top. Finish with some freshly torn basil leaves and serve this colorful dish to your guests. As I mentioned in my previous post, my grandmother came to visit me yesterday and I decided to make this delicious dish from Jamie's 30 minute meals. Served it with my amazing Oven Roasted Rosemary Thyme Potatoes and a simple Winter Salad. Baking chicken this way results in a perfect tender piece of chicken! It's full of flavours and perfect for in the winter. But as you know by now I'm in the mood for Christmas and I'm trying out some recipes suitable for the holiday's and this is definitely one of my favorites! Preheat the grill in your oven and put a large frying pan on high heat. Put the chicken breasts on a chopping board and rub with the dried oregano, sweet paprika powder, pinch of salt and pepper. Make sure all sides are covered and sprinkle over some olive oil. Put a somewhat large piece of butter in the frying pan and a good splash of olive oil. Bake the chicken for 4-5 minutes total in the pan on both sides until their golden brown. Then, put the chicken breasts in a baking dish. Cut the lemon in four and put them, together with the cherry tomatoes, next to the chicken. Pour some juice out of the pan over the chicken breasts and put the slices of Pancetta on top. Put the pan with the rest of the gravy back on the heat, stir the rosemary sprig through, put on top of the chicken and the rest of the gravy in the baking dish and put it for 14 to 16 minutes under the hot grill. Make sure you check whether the chicken is cooked through before you serve! Serve with the Oven Roasted Rosemary Thyme Potatoes and a simple Winter Salad. I don't eat a lot of potatoes, but if I do then I almost always make these delicious potatoes out of the oven! They are so good and I thought, with Christmas coming up that it is finally time to post the recipe. It makes a perfect side dish and everybody who I ever served these potatoes absolutely love them! As a bonus your house will smell fantastic and very homey! It's perfect with chicken or a nice piece of meal for Christmas. But you can also serve them with, for example, chicken burgers. I had these potatoes yesterday when my grandmother came to visit me and served them with Chicken from the Oven. The recipe for the chicken will follow later today! Clean the potatoes under cold running water and halve them (don't remove the skin!). Cook them in a pan with boiling water (all potatoes need to be under water) and some salt for about 10 minutes. Meanwhile, mix the olive oil with the oregano, thyme leaves, rosemary leaves (finely chopped), the garlic (sliced) and the sea salt in a small bowl and set aside. Pour the potatoes and let them evaporate. Mix with the olive oil mixture until everything is evenly covered. Put them on a griddle covered with grease proof paper and place them in the oven for about 25 minutes. Make sure you stir them once a while! When they are golden brown they are done and ready to be served! I'm celebrating my twenty-six birthday next week so I always bake some goodies to treat my colleagues during coffee break to celebrate my birthday. For this purpose I was looking for some new recipes and first I decided to try out a black bean brownie. And oh my gosh! It's even better than just your regular brownie. You don't taste the black beans (I was afraid that it would) and it's just perfect. You can add some more sugar or syrup if you're a sweet tooth but I suggest you first try out the recipe as is! You can have it as a sweet next to your green tea but you can also easily serve it as a dessert (maybe for Christmas dinner!!) with a scoop of ice cream and maybe even some whipped cream! And as a bonus it's super easy too make! Simply add all ingredients to your food processor (it fits exactly) and mix until you have a smooth batter. Grease a baking dish of 20 x 20 cm or a similar size (25 x 17 or something) with some more coconut oil and pour the batter in. Put it in the oven for about 25 to 30 minutes. Test with a toothpick whether it's done, the toothpick should come out fairly clean. Variation tip: Don't throw away the left over crumbles or brownie. These are delicious over you bowl of (Greek) yoghurt or quark in the morning!! Since Christmas is almost here I decided to make some dishes that you could serve as a healthy Christmas meal and I added anothe page to the blog: Christmas on which recipes are posted that, in my opinion, suit Christmas! First up is this delicious recipe from Jamie's 30 minute meals, his piri-piri chicken. Changed the side dishes because this felt more suitable to me. Preheat your oven to 200 degrees of Celsius and put a grill pan on high heat. Sprinkle the chicken thighs with olive oil and season with sea salt & pepper on each side. Put them in your hot grill pan on high heat and grill until that side is golden brown. Slice the paprika's into small stripes and put them in the grill pan until soft when you turn the chicken. Grill the chicken until the other side is also golden brown. Meanwhile wash the potatoes, cut out the ugly spots and prick some holes in it using a fork. Put them in a baking dish covered with a double layer cling film. Put them in the microwave for 14 to 16 minutes on 900 to 1000 watt until their cooked. Make the piri-piri sauce. Peel the red onion, slice is roughly and put in your blender together with the peeled garlic cloves, grated lemon zest, juice of 1/2 to 1 lemon, the deseeded pepper, the paprika powder, white wine vinegar, Worcestershire sauce, salt & pepper and the basil. Add a splash of water and blend until you have a smooth sauce. Poor it into a large baking dish. When the chicken and paprika are done put them on top of the sauce. Place the thyme sprigs on top of the chicken and put into the middle of your hot oven for about 10-15 minutes - depending on how thick they are - until their done (make sure you check after 10 minutes if they are done, if not put them back for another 5 minutes). Meanwhile, mix all the ingredients for the salad and for the dressing and put them in separate bowls on your table. Check whether the potatoes are cooked. Pick the rosemary leaves, chop them finely and put in the baking dish with a pinch of sea salt and pepper and a dash of olive oil. Toss the potatoes equally, put them on your griddle (with grease proof paper) and put them under the grill for a couple of minutes to make sure they become crunchy. Mix the sour creams with the juice of half a lime and some freshly chopped parsley. When you get the potatoes out of the oven, cut in half or crosswise and serve with 1 tablespoon of the sour cream mixture per potato and sprinkle some freshly chopped parsley on top. Getting my new fitness schedule tonight so having a big meal to make sure I have enough energy to train and lift those weights! My favorite pre workout meal is pasta and tonight I made a new one with shrimps, and yes it was delicious! Bake the Shrimps in a large frying pan in 1 tbs olive oil with the crushed garlic clove, the pinch of saffron and cinnamon and sliced anchovy fillets. Slice the vegetables. After 2 to 3 minutes add the sliced mushrooms, zucchini and onion and bake until everything is done. Then add the passata, juice of half a lemon and season with salt and pepper and remove from heat when warmed up. Then mix through the pasta and put it on your plate. Top it of with grated parmesan cheese and some fresh arugula leaves. I just love risotto! I previously posted my superb Quinoa Risotto and a Pumpkin Risotto and now it's time for a little bit of Summer on your plate with this delicious tomato risotto with basil, ricotta and parmesan cheese and the credits go to, who else, Jamie Oliver. Boil 1 liter of water in your kettle. Crush the garlic clove, roughly chop the cherry tomatoes (reserving a couple), place a small saucepan on medium heat. Add 1/2 tbs olive oil and the crushed garlic and fry gently for around 1 minute until lightly golden. Then add the cherry tomatoes with a pinch of salt & pepper, cover with a lid and cook gently for around 3 minutes until soft. Peel and finely chop the onion and add to another pan on medium-low heat with 1/2 tbs olive oil and the other crushed garlic clove. Cook over a low heat for around 3 minutes, until very soft but not colored. Then add the rice and stir and fry for 1 minute. Then crumble over the chicken stock cube with 1 large glass of water and keep stirring until it has been fully absorbed. Then turn up to medium heat and keep add a glass of water during the next about 15 minutes. Make sure you get a good rhythm and add boiling water when the rice has almost fully absorbed the stock before you add the next cup and keep stirring continuously/regularly!! Once about 2/3 liter has been added, stir in the tomatoes. Keep adding water and stirring until the rice is just cooked and the risotto has a lovely, oozy consistency. You may need extra water so make sure you taste! Remove the risotto pan from the heat, stir through the ricotta, and season to taste. Tear in most of the basil, then cover with a lid for a few minutes. Meanwhile mix all the salad ingredients in a small bowl and put in on your table. Season with salt and pepper before you serve and add some freshly grated parmesan cheese and a drizzle of extra virgin olive oil. Top with the remaining of the cherry tomatoes and some fresh basil leaves. 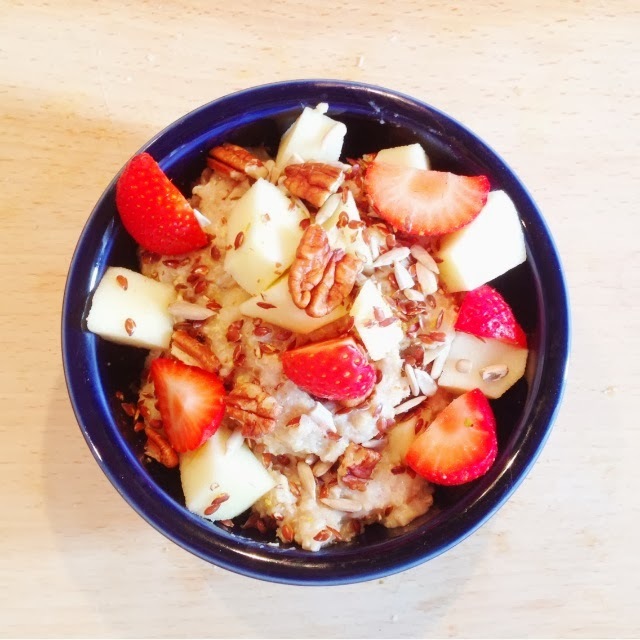 I just got a question from one of my Instagram followers what other things you can have for breakfast besides oatmeal or a bowl of quark with fruit (smoothie bowl). A while ago I made quinoa porridge and I prefer oats, but if you are not a big fan of oats you can definitely try this one because it's still good! But inspired by her question I decided to give it another try as I had a light lunch and was feeling a little bit hungry and it turned out pretty good this time!! This recipe is definitely going to get on my breakfast list! Cook the quinoa flakes in the almond milk for about 10 minutes with 3/4 of the apple sliced in pieces, the sliced banana and cinnamon. After 10 minutes mix trough the yoghurt or quark and let it sit for 5 minutes. Slice the rest of the apple and strawberries. Put the quinoa porridge in a bowl and top with the rest of the fruit, some linseeds, sunflowerseeds and the slightly crushed pecans. After my workout this afternoon I was really hungry and really needed some protein and salmon is perfect for this! So I decided to make another recipe by Jamie, but really sumplified it because I didn't have all the ingredients and I found it to much work. This time salmon with green tea, coconut rice and replaced the vegetables with sugar snaps. When the rice is cooking for 10-15 minutes, rub the salmon with the green tea on all sides, season with some salt and pepper and put it with one tablespoon olive oil in a hot frying pan and bake on both sides until golden brown and done. Clean the sugar snaps. Poor the rest of the boiling water in another pan and cook the sugar snaps for about 6-8 minutes or until soft. Put the rice on your plate with the sugar snaps and layer the salmon on top. Optional: season with some fresh coriander leaves and serve with lemon parts on the side. Inspired by one of my favorite instagram accounts: sassyballerina, who also blogs about food on: Hip & Healthy - Food I made this delicious sandwich! I simplified it to make it more budget but I was still amazed by the combination of flavors! In my opinion this is a perfect healthy sandwich for Winter and would also make a delicious, Christmas colored, breakfast during the holiday's! I'm sure it will be part of my Christmas breakfast! Since I'm also working on a post on how to 'survive' Christmas in the most healthy way whilst you van still indulge in some not so healthy or clean treats, this is the perfect example of a healthy festive treat! Toast the slices of bread. Then mash the avocado on both slices of bread and season with pepper. Put the arugula on top, slice the cherry tomatoes in half and put on top followed by the pomegranate seeds and your delicious open sandwich is ready to be eaten! This grilled tuna sandwich is an oldie but a goodie. My mother used to make this for me all the time and since I had all the ingredients I decided to make this one for lunch today! The melted cheese is a cheat because melted cheese can't be absorbed by your intestines, but for this sandwich it's only a small amount and sometimes you deserve little cheats like these! Preheat the grill in your oven. Slice the baguette in half and put the cottage cheese on each side, seasoned with pepper. Followed by the tuna, tomato slices and grated cheese. Put them in the oven under the grill for about 10 minutes. But make sure to keep an eye out and get them out if they start to get golden brown! Persimmons (for the Dutchies: Kaki Fruit), for me a 'new' type of fruit which I just tried and they are delicious! But you have to make sure they are ripe and soft when you eat them because then the sweetness is even better! The fruit is high in Vitamin C so perfect for Fall and Winter! We had a heavy bootcamp training session this morning so when I got home I was really hungry! Found a persimmon in my fruit bowl and decided to make another smoothie bowl with it! It's perfect, high in protein due to the quark so perfect for building those muscles! Simple add 3/4 of the persimmon (cut into pieces) and 3/4 of the banana (sliced) to your blender together with the quark and blend until smooth. Add a splash of water if it doesn't blend well. Poor it into a bowl and top it with the rest of the persimmon and banana. Add the granola and the chiaseeds and your delicious breakfast or post workout snack is ready to be eaten! Cook water in your kettle and preheat your oven to 200 degrees of Celsius. Peel the skin from the sweet potato with a peeler and cut it into cubes of roughly the same size. Boil these 10 minutes in a pan with some sea salt, until they are fairly soft. Meanwhile, cut the ends of the beans and get the fish out of your refrigerator and pat dry with paper towels and sprinkle with salt & pepper. Crumble the bread in your food processor and put in a small bowl. Finely shop the parsley and at this to the breadcrum with some lemon zest, the olive oil, quark, juice of half a lemon, sweet paprika powder, salt and pepper and mix well! Put the fish fillets in a greased baking dish and spoon over the quark mixture and bake in the oven for 8 to 10 minutes depending on how thick the fillet is). Cook the green beans for about 10 minutes. Drain the water from the sweet potato, pat dry with paper towels and add to a hot frying pan with 1 tablespoon olive oil and fresh thyme and rosemary leaves. Bake for about 5-8 minutes. When everything is done put the beans on your plate with the fish on top and the potatoes on the side. I just love fruit! It's one of my favorite healthy snacks and I incorporate them in my diet every day! Since I don't eat any artificial sugars any more fruit is really my moment to have something sweet. Try it yourself! Stay away from any products that contain a lot of refined and artificial sugars and syrups and your taste buds will adapt and your fruit tastes way better and much sweeter! Sometimes I really crave a cake or something else with sugar and that's just my body telling me that it is in need of a sugar boost. I think it's really important to listen to your body, but instead of going to buy a cake I reach to fruit instead! The amount of sugar that each type of fruit contains vary greatly so it's good to have some information about the natural content of sugars in fruit. But I do want to stress that fruit is healthy! Not as healthy as vegetables but still very healthy! Fruit contain mostly simple carbohydrates which in theory makes them part of the 'bad' carbohydrates and sugars. But fruit also contains high amount of dietary fibers. These fibers inhibit the absorption of sugar and this combination makes this the only simple carbohydrate that is healthy! If you want to avoid a rapid raise in your blood sugar levels you can also add some unsalted and unroasted nuts to your snacktime (see: Fruit as a Healthy Snack). Of course variation is key, so vary your fruits because different fruits have different positive effects on your health because they contain different vitamins, minerals and nutrients. But to give you insight into the natural content of sugar in fruit I found this chart which could be helpful if you want to keep track of your sugar intake! Note it respresents the amount of sugar per 100 grams of fruit! Last Sunday I made this delicious grilled Portobello sandwich from Jamies 15 minute meals! I had it for dinner so I ate two of these sandwiches but they are also perfect for lunch at home, just use half of the ingredients. And if you want a vegetarian option just omit the ham! The original recipe has a radish salad on the side but I choose not to and just have two of these amazing sandwiches! Preheat your oven to 200 degrees of Celsius and bake the spelt baguettes. Cut the stems of the Portobello's and put the caps in a grill pan on high heat. The water will go out of them! After about 5 to 8 minutes they will be done. When the baguettes are done get them out of the oven and put the oven on grill position. Put the mushrooms in a baking dish with the slices cheese on top. Sprinkle over some fresh thyme leaves and put under the grill in the oven until the cheese is melted (about 5 minutes). Meanwhile, cut the pear into quarters, put them in the hot grill pan and turn when grilled on one side. Then put it the raw ham and bake for 1 to 2 minutes. Put the cottage cheese on the sandwich, season with salt and pepper. Slice the tomato and put on top with the salad or arugula. Get the Portobello's out of the oven, halve them and put them on the sandwich with the smoked ham. Put the pear on the side and your dinner or lunch is ready! Last Saturday I had a couple of friends over from Bootcamp and made them dinner! As a starter I decided to make these fig and ham bruschetta's from my new Delicious cookbook which I got from my mom. And they were delicious, perfect combination of flavors! It fits an Italian meal very well. Of course you can also use the ingredients to make a delicious lunch baguette! Just substitute the ciabatta for whole wheat or spelt bread and cut the figs smaller after you grilled them! Put your grill pan on high heat. Lightly brush both sizes of the ciabatta slices with olive oil and put them in the grill pan for 1 to 2 minutes each side until golden brown. When they are done put three pieces on each plate. Then halve the figs and lightly brush the pulp with olive oil and put them 'pulp-down' in the grill pan until they are caramelized (takes about 1 to 2 minutes). Meanwhile put the slices of raw ham on top of the ciabatta. When the figs are done put 4 on each plate on top of the ham and crumble over the goat cheese. Finish with some fresh basil leaves and your starter is ready! Variation tip: If you're not a hugh fan of goat cheese you can also use feta cheese or blue cheese.